HIDDEN GEM IN SHOREWOOD - A COUNTRY FRENCH HOME REVIVED FROM MISHAPS & MISCUES - Stanton Architects, Inc.
Last year Denny and Penny Matlak were on a mission to find a home. They unexpectedly came across a hidden gem but knew it needed tender loving care. They were excited about the wonderful open layout and “good bones.” After falling in love with the home, they sought our consultation before submitting an offer, knowing we originally designed the home but others built it. The benefits to keeping the designer involved throughout the story become evident. 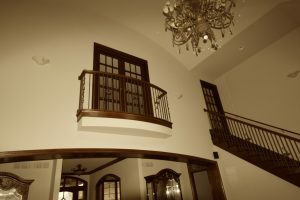 Juliet balconies with ornate wrought iron railings overlooking voluminous breakfast and great room spaces needed consideration. The balcony over the breakfast area has a seamlessly set of French glass doors. The other balcony in the great room had an informal arched opening with trim that did not appear to fit within. We suggested removing the plastered motif and adding matching French doors, which prominently enhanced the great room. 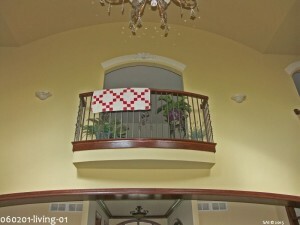 This modification effortlessly helped save heating/cooling energy overflow from the loft into the great room. The master bath ceilings appeared distracting from two adjacent, dominating, and classically decorated ceilings. To minimize expense, it was best to flatten out the barrel ceiling so the tray ceiling, accentuated by bay windows, became the uninterrupted focus. Crown molding was added to highlight the chandelier, gracefully centered on the tray ceiling over the spacious and luxury soaking tub. Most of the home’s original tile selections were elegant, but amateurishly placed. The resolve to an abrupt termination of unfinished ornate trim bordering the master tub was to study the tile’s details and match with a close resemblance to the original design. Covering exposed, damaged and paint-peeled drywall at the shower opening with the same tile created a uniform and appealing look. The wood base trim and casing were replaced with oversized bullnose for visual ease and durability, allowing for routine bath wall/floor cleaning. Last, but not least, the shower curb sill was re-installed so water drips away from the drying area. Many more mishaps and miscues that needed attention originally astounded Denny and Penny. Dreaded past encounters with unscrupulous tradesmen were intimidating but, with our “Midas” touch, we convinced them otherwise. They were able to relax and collaborate with us to work within budget and prioritize the best solutions. 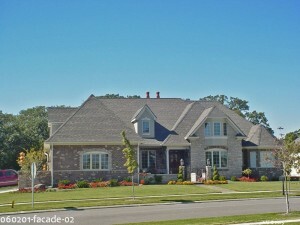 Consequently, we provided the dream for their new home, inside and out. They are now able to fully enjoy their hidden Shorewood gem with minimal renovation investment.